Holiday traditions are the best! Because Andrew and I don’t live near our families, we have this tradition of celebrating Christmas at home the night before we start our holiday travels. Every year we exchange ornaments, give the pups their gifts (yeah, they get gifts too), and watch Love Actually. We did this last night and I think it’s safe to say that the dogs should be set with toys for the next couple of years… might have gone a little overboard. Should I be embarrassed for telling you this? Anyways, family time is going to come before blogging time this week, so I wanted to leave you with one last recipe before the New Year. 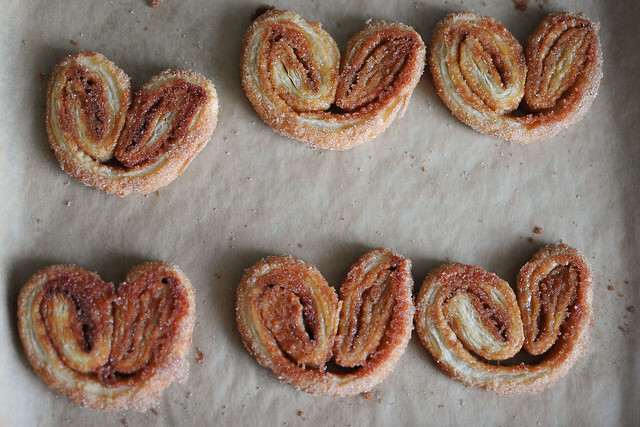 I’ve always had a soft spot for palmiers… with all that butter and sugar, what’s not to love? This version is made super simple by using store bought puff pastry and has a touch of cinnamon (just because I love it). These cookies may very well become a tradition in my house every Christmas–they are REALLY good. 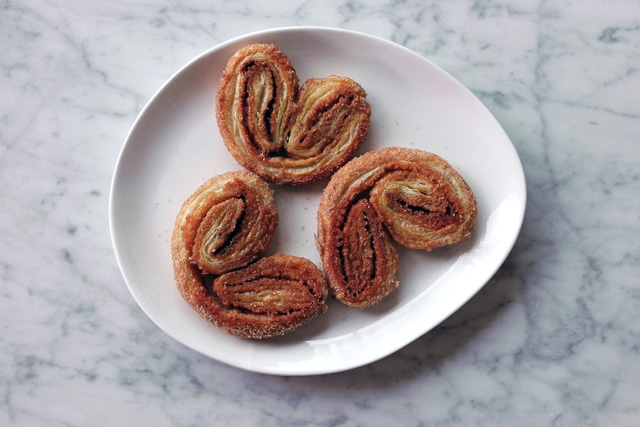 Amazingly, these palmiers have very few ingredients and only take a few minutes to assemble and bake. First, you mix up some sugar, cinnamon, and salt and dump half of the mixture on your work surface. Then, you place the puff pastry sheet on top and dump the other half of the sugar mixture on the puff pastry. After smoothing out the sugar mixture, you take a rolling pin and roll out the pastry (making the square larger and adhering the sugar mixture to the pastry). Then comes the tricky part: rolling up the pastry dough. Truthfully, it’s not tricky to do at all; it’s just hard to explain in words. I explain it two different ways in the recipe–hopefully one of them makes sense. Once rolled up, cut with a sharp knife and they are ready to bake! They seem to “bloom” when they are in the oven and I love how they look like hearts when they are done. I’m off to the Midwest for some family time! Hope everyone else has a wonderful holiday! And remember, this is the time to indulge and be merry (healthy eating can wait ’til after the New Year)! 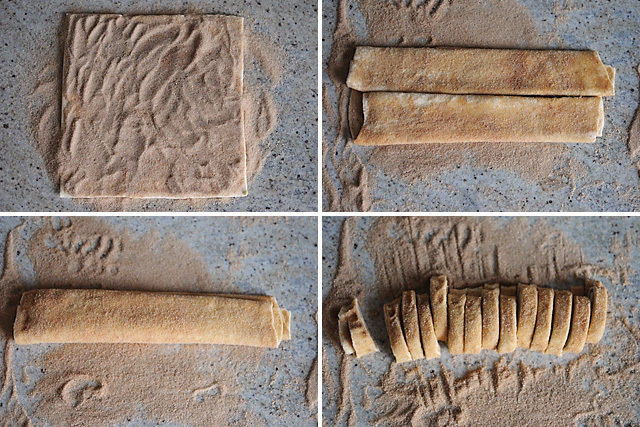 The trick to using puff pastry is keeping it cold, so if your puff pastry starts to get sticky or difficult to work with, throw it back in the fridge for a few minutes. 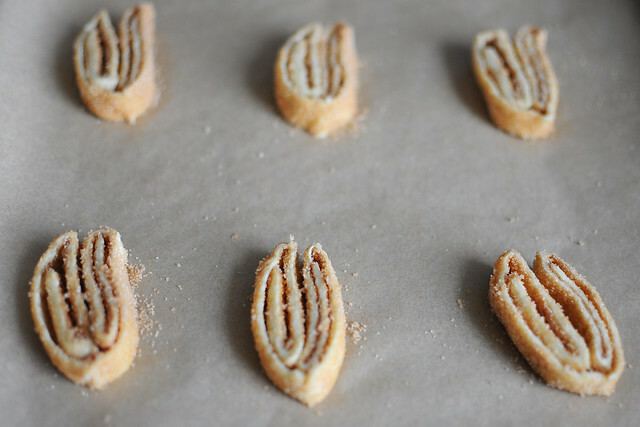 These are also great make-ahead cookies. You can assemble them, freeze them, and then bake them off whenever you need. Preheat the oven to 450 degrees and line 2 baking sheets with parchment paper. Whisk together the sugar, cinnamon and salt and pour half of the mixture onto a clean surface. Unfold the sheet of puff pastry onto the sugar mixture and then pour the remaining half of the sugar mixture on top and spread it evenly across the puff pastry. 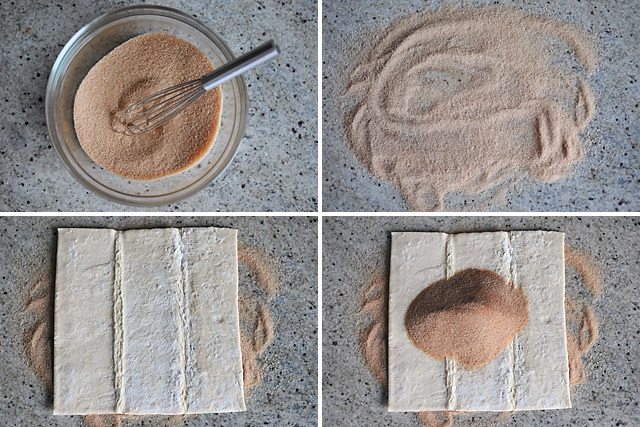 With a rolling pin, roll the dough out until it is a 13 by 13-inch square–the entire piece of puff pastry should be covered in the sugar mixture and not all of the sugar mixture will get used. Fold two opposite sides of the square so that the edges are halfway to the center of the square, and then fold over the sides again so that they meet in the middle (each side should have 3 layers, so if it helps, you can envision the square divided into 6 long strips and fold a sixth of the dough over on each side twice until the edges meet in the middle). Then fold one half of the pastry over the other (like closing a book). Slice the dough log into 3/8-inch slices and place the cookies cut side up on the prepared baking sheets. Bake for 6 minutes, until the bottoms have caramelized and then flip them over and bake for another 3 to 5 minutes, until the other side has caramelized (mine took a bit longer than this). Transfer to a rack to cool completely. These look adorable – love the little heart shape. They sound delicious and very moreish too! I made these tonight to take to work!!! So easy and yummy. 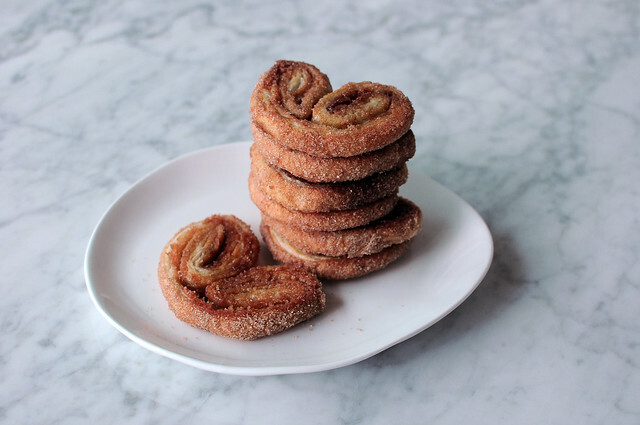 The larger version in bakeries called elephant ears were my favorite as a kid. Thanks!